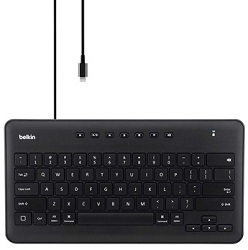 Secure, slim, and lightweight, the plug-and-play Belkin Secure Wired Keyboard is the perfect partner for comfortable typing and standardized testing. Bluetooth wireless keyboards are not always permitted in school testing environments, and battery-powered or rechargeable keyboards can run out of power at unfortunate moments, with unfair consequences. Integrated multimedia controls offers convenient one-touch access to a variety of features, including volume, mute, play/pause, fast-forward, rewind, and screen lock. Additionally full-size arrow keys allow users to navigate easily through documents and websites.